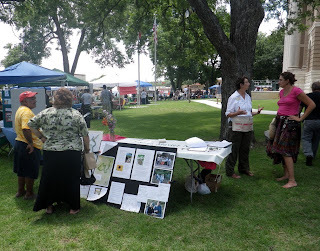 Only two of us manned the booth at the 2013 Foodstock event held on the courthouse lawn Saturday, July 27th. Early morning rains and a cloudy sky kept temperatures bearable and who could resist visiting the booths arranged under the large pecan trees? In addition to the bands there were food samples, sno cones for sale and many organizations set up to support the Hays County Food Bank. Leah Laszewski talks to a visitor while others gather around. SMGA shared their table with the Master Naturalists who comprise a percentage of our membership. The two organizations are a good fit as stewards of the five natural areas that circle the city of San Marcos, TX. We had many visitors and even a couple of trail crew volunteers sign-up to begin work on Thursdays. The big draw for the display was the new Loop & Check map which shows a future connection to the Violet Crown trail and the recent acquisition of additional acreage to the Purgatory Creek Natural Area thanks to the Trust of Public Lands and other generous organizations. Visitors retold their favorite trails and adventure stories. Questions about signage and trail markers were at the top of the list of concerns but everyone agreed that the city is fortunate to have these properties available for both residents and visitors to the Hill Country.